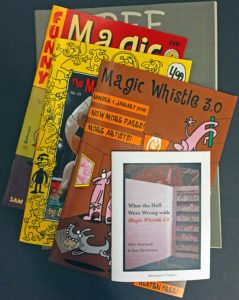 Bargain priced bundle of three issues of Sam Henderson’s Magic Whistle (vol. 2 #14 & 15, Vol. 3 #1), The Free Ice Cream collection of gag panels from The New York Observer, and a bonus mini-comic. 160 pages of hilarious comics for half the original cover price.